Do you know why grains should be soaked overnight — prior to cooking? Not only does soaking reduce cooking time, but it also aids in digestion! How? Well, grains are seeds that contain enzyme inhibitors. Soaking neutralizes these enzyme inhibitors, which is great because we need enzymes in order to properly digest the foods we eat. Grains also have anti-nutrients such as phytic acid, which soaking breaks down as well. 1 tablespoon acid per 1 cup liquid, such as kombucha, raw apple cider vinegar, lemon juice, buttermilk, kefir, whey, yogurt, etc. The night before, combine grains, water, and acid in a pot. You want to soak the grains for at least 7 to 8 hours prior to cooking them. Cover pot and let sit out on counter. When ready to cook, add oil and salt. Bring to a boil. Reduce heat to low and cover. Allow to simmer for time listed (see chart below), or until grain is tender and all water is absorbed. Don't lift the lid while cooking, except very quickly once or twice to check that it is still simmering gently. When cooked, remove from heat. Let stand, covered, for about 15 minutes. Fluff with fork. Enjoy! Also see the Gluten-Free Grain Cooking Chart. Do you soak your whole grains before cooking them? Are these cooking times for soaked grains? I didn’t know that Molly Katzen soaked her grains. If so, I am going to have to check this book out of the library! Thank you for posting this helpful chart. Kelli – no they’re not, I realized that after a bit. The cooking time will be less than the times listed here, sometimes by as much as half. Watch for tenderness and full water absorption. Hi, thanks for this useful list of cooking times for unsoaked grains. Do you have or could you point me to a list of cooking times for soaked grains? I understand that the cooking times will be shorter, but a new list would be so helpful. Wardee, I’m confused. Your listing for couscous has an asterisk that means, “Soak, don’t cook.” We always cook our couscous, so I’m not sure what this means? According to this chart, do we not cook couscous? Because the chart also says to cook it for 10 minutes. .-= Julieanne Miller´s last blog post… When I Grow Up, I Want to Be a…Doctor! (e-book review) =-. Julieanne – Thank you for pointing out those areas that need clarification! Regarding the couscous – the way I cook it is to pour boiling water over it, and let it sit covered, in the boiling water (but not on the burner) for 10 minutes. I do not believe this is a grain that needs to be soaked, because if it is made in a traditional way, the soaking/pre-cooking has already taken place before we get it. So, the process is really easy, just pour boiling water over it and let it sit. Oh, you know what… ignore me… when putting this together, I had a brain freeze, I guess… I was thinking of couscous as bulgur! So that is a mistake. Couscous does need cooking. I starred it by mistake. As far as the cooking times, well… that is going to have to be a matter of experimentation. You’re right not to lift the lid unnecessarily. But, I find I have to break that rule. 🙂 What I do is take a quick “peek” about halfway through the regular cooking time to see if the water is all absorbed or not. I try to minimize the interruptions. In the case of rice, I find that it is cooked in about 25-30 minutes if it has been soaked overnight. I found a more effective way to soak brown rice, detailed HERE at my site. It’s really easy and gets rid of the phytic acid quite effectively (which is not actually that low in rice). Sometimes I do saute the rice in oil, then soak it – I have no idea if it still works for the phytic acid, but it does work for the end result! I end up cooking the same amount of time, about 45 minutes, as with unsoaked rice. I add new water to about 1/2 cup less since the rice has absorbed some water during the soaking process. ohhh-this will save MANY a frustration in the kitchen. I’m going to print this out (if you don’t mind) and stick it on my fridge! .-= c´s last blog post… blunders and absurdities =-. C – No, I don’t mind! Enjoy! Let me know if you find any mistakes. 🙂 My site is set up so if you just hit Print (Ctrl-P), the post will print without all the sidebars, etc. It comes out formatted very nicely. Umm good to know! I will remember that. Do I understand correctly? The grains/rice are cooked in the same water they soaked in? .-= Marg´s last blog post… The barn roof =-. Marg – Yes! Though you may rinse them if you like. As far as I’ve read, you should throw away the soak water as that has the phytic acid you just leached out, as well as whey or vinegar that you may not want in your cooked grains. You can toss the soaking liquid if you don’t care for the flavor of vinegar in your rice. The whey or vinegar offset or neutralize the phytic acid so it isn’t a problem to cook in soaking water. I need some troubleshooting help! I cooked spelt berries for the first time, and since I just came across this table, it’s the only instructions I had. I soaked 1 cup berries in 1 1/2 cups water (with a little whey) overnight and cooked them today – brought to a rolling boil, added a little salt and olive oil, and left the lid on 50 minutes. Lots of water left. 10 more minutes. Still lots of water left. 20 more minutes. Drained the things and gave up. They’re pretty chewy, in my fridge waiting to be a cold grain salad (inspired by your post last week!). But I’m wondering: did I do something wrong? Should all the water be absorbed? Should spelt be chewy? I often have trouble with my soaked rice not being tender after cooking 45 minutes and absorbing all the water. I use 2 cups water to 1 cup rice, but I’ve found that when soaked, it actually needs a little more to be totally soft. Have you really cooked a cup of brown rice with only 1.5 cups water? NT’s “basic brown rice” has a 2:1 water:rice ratio too. Katie – I will have to edit that chart. I’ve had it for so long and got it from a Molly Katzen book. I use 1:2/rice:water just like NT. As for the spelt, it has been a long time since I’ve cooked them, but I remember them being very chewy after a long cooking time. Are you certain they’re not done or are they just chewy? Hi Wardee! Thanks for this post; I sited it in my last blog. I’m just wondering, I always soak my beans overnight before cooking but only in water. Are beans different than grains in that water is sufficient or should I be soaking them in acid as well? Does the quinoa end up being a bit mushy when it is soaked? Mine didn’t come out nice and fluffy for tabouli- the way it is when unsoaked. Did I do something wrong? Thanks. Regina — Hi! Mine doesn’t usually come out mushy when I soak. Here are some thoughts for you. 1) There could have been excess water. 2) Did you let it stand for a good while to give up alot of its heat before digging into it? If it is still warm when scooped out, the grains will smoosh together. For tabouli, I let it cool waaaayyyyyy down before using it. I even chill it. I am new to soaking grains so let me just make sure I understand this correct. I soak the grains in the same water (post above answered that question) that I am going to be cooking it in. I soak the grains on the counter with no covering, just the amount of water + rice in a bowl. I can soak for longer then 7-8 hours correct? If I wanted to start soaking tonight but couldn’t cook the rice until I got home from work around 5 would that be to long of a period to soak? If I ran late and didn’t have time to cook the rice before work I wouldn’t want it to be ruined. I would be soaking it almost a full 16-24 hours instead of 7-8. Mariah — a 16 to 24 hour soak is fine. You might find it helpful to rinse the grains after that long because the soaking water is probably more sour and maybe a little scummy. Some people like to rinse after only 8 hours. It is a matter of preference, really. I wouldn’t say no cover during soaking — either a lid, plate or even a towel to keep dust and bugs out. Otherwise I think you’ve got it! I have a question. What if I (routinely) forget to start 8 hours ahead? Is there any point in a shorter soak? I am wondering about soaking rolled oats, the list says oat groats, is that because it is just better to eat oat groats or does that include rolled oats? thanks for all of the amazing information. Krista — You can do rolled oats as well. 🙂 The only oat I don’t recommend is quick oats because they’re processed and not whole. The rolled oats will cook much faster than oat groats. Anyone know where I can purchase Manitok wild rice? I’m confused! LOL If I am going to mill wheat berries should they be soaked (and dried) prior to milling in my NutriMill? I was just about to ask that same question. Hopefully, someone can clarify! 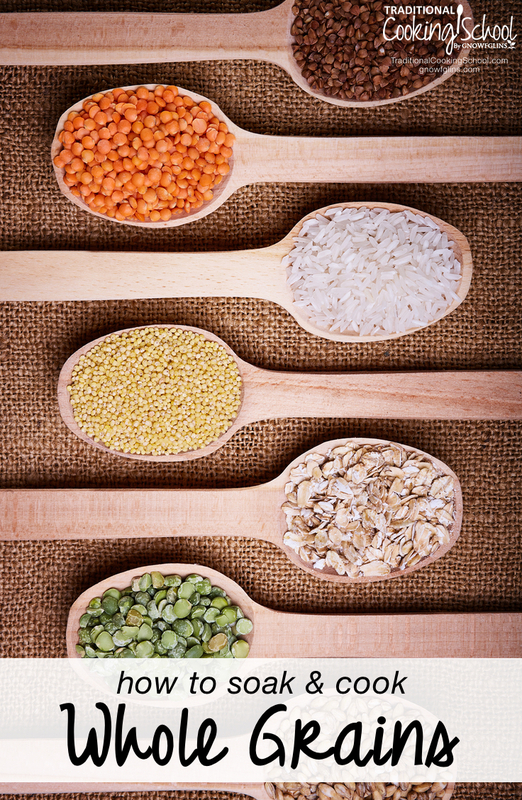 Grains need to be properly prepared to reduce phytic acid. Soaking, sprouting, and sourdough are methods to reduce phytic acid. So depending on how you plan to use your flour will determine which method you should use. If you wish to have sprouted flour to use for things like cookies then sprouting, dehydrating and then milling, would be the proper process. Hello, I have a question. I like to cook some of my grains with soy or almond milk. Can I just soak the grain in that overnight and then cook it, or will it mess up the acid balance? Should I soak in water and then pour it out and then add the soy/almond milk? Thanks for your input. Yes, you can soak them in almond milk as long as you’re adding an acid. We do not recommend using soy milk as the soy is not fermented and not a healthy, traditional option. Soaking rice helps with digestibility and can help reduce arsenic levels. You can drain the soaking water and replace with clean water before cooking. Does anyone have a recipe for “Cream of Wheat” using einkorn berries? Wardee has a great recipe called Soaked Einkorn Porridge in her #AskWardee episode 100 on Home Grain Milling 101: More Things Your Grain Mill Can Do! How much water and cooking time for einkorn berries? Thank you! Combine einkorn berries, water, and acid in a medium-size pot. For 3 cups einkorn use 6 cups of water and 1 tablespoon sourdough starter or raw apple cider vinegar. Give it a little stir, then cover and let soak for 7 to ? 8 hours or overnight. When the soaking time is over, add sea salt and coconut oil. Over medium-high heat, bring to a boil. Reduce to a simmer, cover and let cook undisturbed until all water is absorbed 40 to 50 minutes. Remove from heat. Let stand 10 to 15 minutes. Serve or chill for other uses. Just a quick question or two please.. I understand millet and buckwheat are not grains could you just use mineral salt for this soak?? Also do you have any information about popping (puffing) millet, buckwheat, amaranth please. I’m not quite sure if you would soak, dehydrate and then pop…however in saying that doesn’t millet and amaranth need to be cooked? We still advise soaking with an acid for millet and buckwheat. We don’t have any information on popping, I’m sorry.